Patricia Lagarde, “Quetzalcoatl, The Rabbit The Moon Or The Invention Of Photography”, 2018. Image courtesy of Jack Fischer Gallery. Ongoing to February 23– Patricia Lagarde: Luna at Jack Fischer Gallery: Almost two thousand years ago, Luciano de Samósata described the first expedition to the moon. He imagined that a ship dragged by a storm, rose and navigated through space for seven days and on the eighth arrived at a round and bright island, the moon. Many authors have narrated stories influenced by myths and folk tales. Beyond the historical moment of Neil Armstrong walking the surface of the moon, Luna explores the mystery of the moon, the poetics of that star that regulates the tides and allows fertility on earth, the original myths and about the time that unceasingly passes by. Lagarde’s work addresses themes of memory by exploring collections of objects centered on memories. 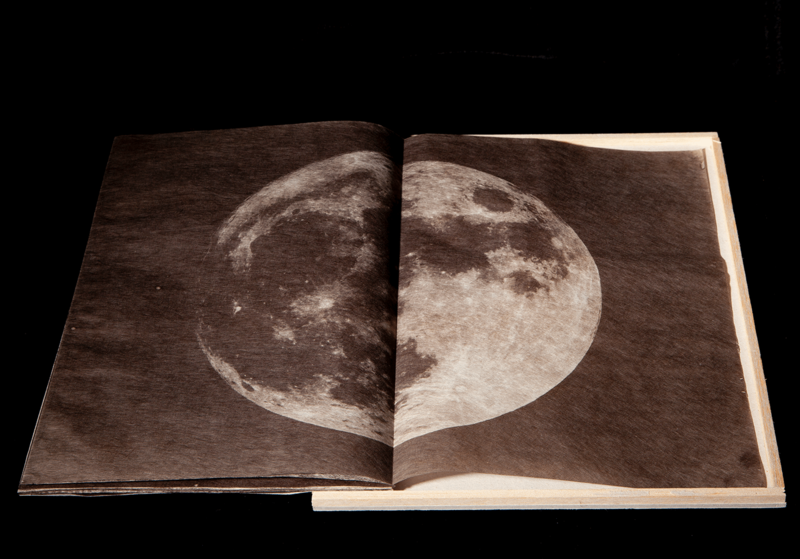 By using alternative process photographic techniques, such as the ambrotype, ferrotypes, and cyanotypes, the artist imparts mundane objects with a fascinating yet obscure history. These works begin to suggest a cultural background that we can only guess at as we are led in an endearing journey of a certain time period or memory. Jack Fischer Gallery is located at 1275 Minnesota Street. Todd Hido, “#11801-1971”, 2017. Image courtesy of Casemore Kirkeby. February 2 to March 30– Todd Hido: Bright Black World at Casemore Kirkeby: Exploring the dark topography of the Northern European landscape, this new work highlights Hido’s first significant foray extensively photographing territory outside of the United States, recording new psychological geography and environmental concern. Hido’s photographs mysterious suburban scenes, desolate landscapes, and stylized portraits. He travels through North America capturing places that feel at once familiar and unknown; welcoming and unsettling. The narrative shift from the personal to the political-environment is apparent in Hido’s new work. 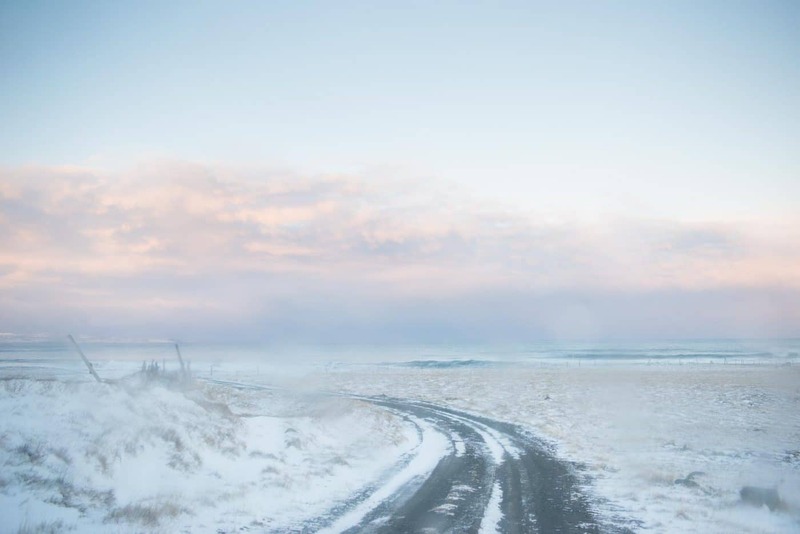 Iceland, formed by lava fields, mountains, and glaciers, transports viewers to a seemingly other world. Images of lifeless roads approaching horizons evoke a sense of abandonment and formerly lush forests are dwindled to twisted embers. Casemore Kirkeby is located at 1275 Minnesota Street, #102. 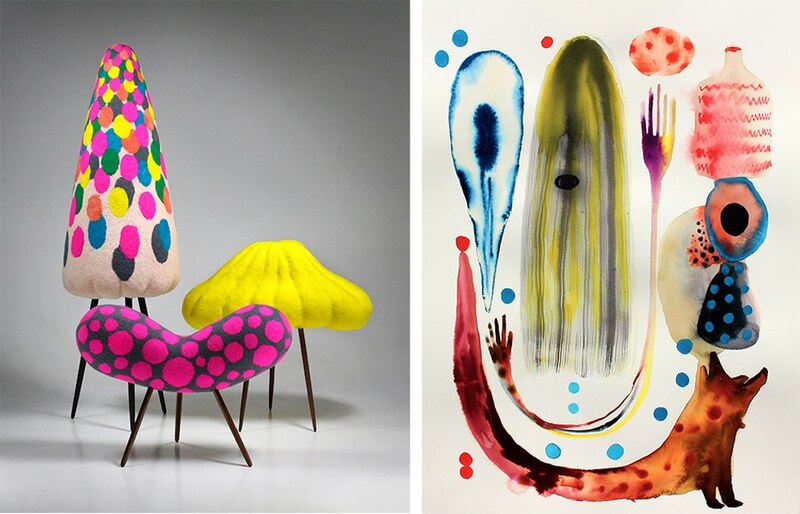 MASAKO MIKI, (left) “Karakasa-obake (umbrella ghost)”, 2018; “Ungaikyo (possessed mirror)”, 2018; “Kinoko (mushroom ghost)”, 2018. (right) “Hyakki Yagyō (Night parade of One Hundred Demons), Fox’s Dream”, 2018. Images courtesy of CULT/ Aimee Friberg Exhibitions. Ongoing to February 23– MASAKO MIKI: Shapeshifters at CULT/ Aimee Friberg Exhibitions: Masako Miki explores the ideology of transitional space, through the lens of her ancestral narratives, specifically Buddhist and Shinto traditions and early Japanese folklore. By reinventing visual symbols and narratives from her cultural traditions, Miki suggests alternative interpretations of ancient symbols, making a new synthesis possible. In the exhibition, Miki uses the Shinto concept of, yōkai, or “shape-shifters” as a metaphorical departure point to explore blurred boundaries and dichotomies within the human condition. In Shinto mythology, yōkai are animated characters who can shift their form to appear as different objects. They range from living things including animals and humans, to inanimate objects like tools such as sandals, prayer beads and mirrors. As a Japanese immigrant woman living between two cultures, shapeshifting can be seen as a metaphor for cultural adaptation and survival. CULT/ Aimee Friberg Exhibitions is located at 1217 B Fell Street. View from 2017 event. Image courtesy of CODEX. 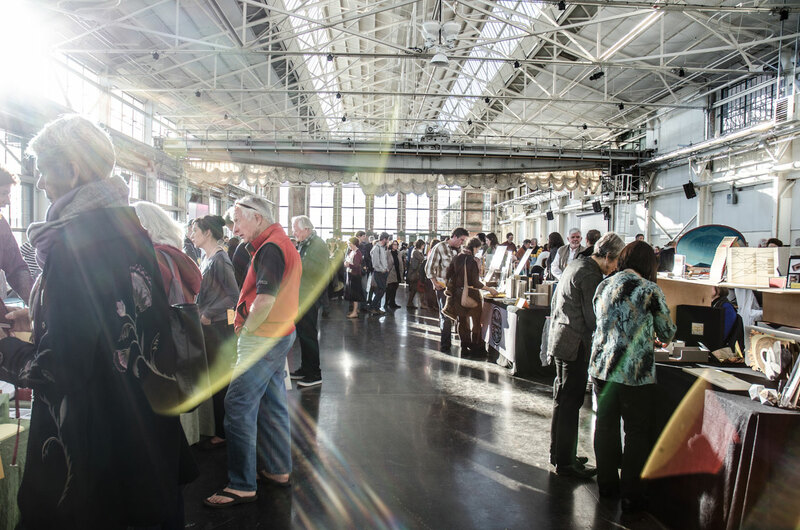 February 3 to 6, 12:30- 6pm– CODEX VII Book Fair at Craneway Pavilion: Every two years the CODEX book fair takes place in Richmond with over 100 exhibitors from around the world. The books in the fair range from historically significant publications to contemporary books, offering a rich history of the civilization of the book. The Codex Foundation preserves and promotes the contemporary hand-made book as a work of art. The goal of the fair is to bring public recognition to the artists and the craftsmanship. Craneway Pavilion is located at 1414 Harbour Way South in Richmond, CA. María Elena González, “Bark Framed #5”, 2012. Image courtesy of Mills College Art Museum. Ongoing to March 17– María Elena González: Tree Talk at Mills College Art Museum: Exploring the translation between the physical and the acoustical, María Elena González investigates the unexpected visual parallels between the bark of birch trees and cylindrical player piano rolls. González graphically recorded the distinctive bark pattern from three birch trees found in Maine onto long rolls of fine paper; the transcriptions from each tree resulted in unique compositions for the piano player. Mills College Art Museum is located at 5000 MacArthur Blvd in Oakland. 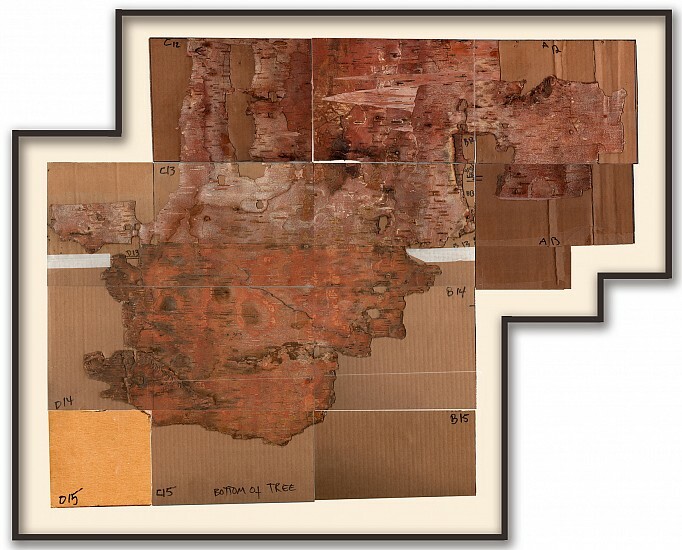 In collaboration with the exhibition, composers Marc Zollinger, John Ivers, and Dirt and Copper will perform works generated from María Elena González’ birch tree rubbings. The composers translate the visual, gestural, and topographic data found in the tree rubbings into scores to be premiered at the event. (left) Ellen Berkenblit, “The Lane “, 2018. (right) Sarah Braman, “Bird Call”, 2018. Image courtesy of McEvoy Foundation for the Arts. 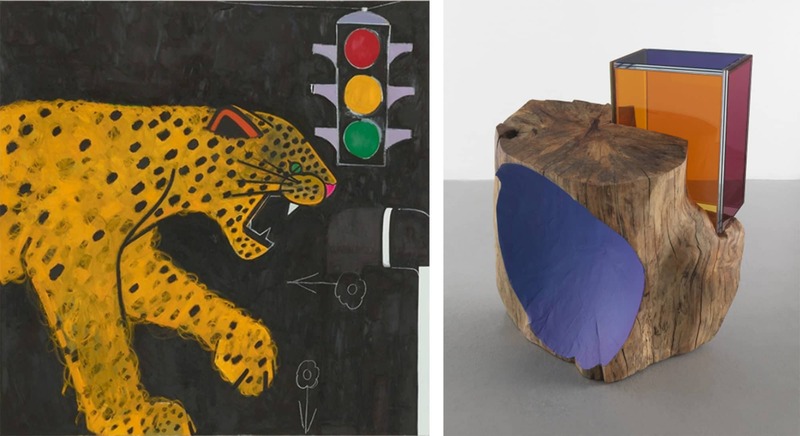 Ongoing to May 4– True Blue Mirror: Ellen Berkenblit and Sarah Braman at McEvoy Foundation for the Arts: True Blue Mirror stages a theatrical dialogue between Berkenblit’s gestural, semi-abstract paintings and Braman’s blocky, quasi-mystical sculptures and environments. The exhibition brings together for the first time Braman’s sculptural animation of vernacular materials – camper shells, chairs, wallpaper – with Berkenblit’s boldly realized, often recurring cast of characters that are imbued with a Pop sensibility. Their pairing proposes an impromptu stage production of sorts, engaging Braman as set designer and Berkenblit as casting director. Juxtaposing the work of the artists reveals correspondences in line, color, and composition, yet differences in scale and dimensionality, as reflected and refracted through the vision of the other. McEvoy Foundation for the Arts is located at 1150 25th Street, Building B. View of Brendan Fernandes, “The Master and Form”, 2018. Image courtesy of the artist and Monique Meloche Gallery, Chicago. February 21, 5 to 10pm– Brendan Fernandes’ Inaction: A Performance with The New Ballet Studio Company at the San José Museum of Art (SJMA): Choreographer and artist Brendan Fernandes, a former dancer, is acutely aware of the particular way in which ballet dancers are trained to walk. Their strut broadcasts an authority, a calculated deliberateness, which Fernandes notes is “not unlike the presented authority of the museum.” In Inaction, Fernandes has choreographed the movements of a team of dancers to explore boundaries and thresholds within SJMA’s building. Blocking entryways, restricting doorways, and disrupting normal circulation, the dancers draw attention to borders and bodies within the Museum, and by extension to the growing tension surrounding borders and bodies in the world at large. SMJA is located at 110 South Market Street in San José.